This data set provides a map of wetland extent, vegetation type, and dual-season flooding state of the entire lowland Amazon basin. As described in Hess et al. (2015), the classified image was derived from the Global Rain Forest Mapping Project (GRFM) Amazon mosaics (Rosenqvist et al., 2000; Siqueira et al., 2002) acquired during Oct.-Nov. 1995 and May-June 1996, corresponding to the low-flood and high-flood seasons for much of the central Amazon. Hess et al. (2003) mapped wetland extent, vegetative cover, and flooding state for an 18 degree × 8 degree portion of the central Amazon using the dual-season GRFM mosaics. This study extends the previous wetlands mapping to report the first validated estimate of wetland extent, cover, and flooding for the lowland Amazon basin. A wetlands mask was created by segmentation of the mosaics and clustering of the resulting polygons; a rules set was then applied to classify wetland areas into five land cover classes and two flooding classes using dual-season backscattering values. The mapped wetland area of 8.4 × 105 km2 is equivalent to 14% of the total basin area (5.83 × 106 km2) and 17% of the lowland basin (5.06 × 106 km2). The mapped flooding extent is representative of average high-and low-flood conditions for latitudes north of 6 degrees S; flooding conditions were less well captured for the southern part of the basin. There are two GeoTIFF (.tif) image files (the same wetlands map) provided with this data set using two coordinate systems: unprojected (Geographic) with pixel size of 3 arcseconds, and Albers Conical Equal Area with pixel size of 100 m.
Figure 1. Wetlands of the lowland Amazon basin, mapped during May – June 1996 (high water). This data set was archived in August of 2015. Users who download the data between August 2015 and July 2020 must comply with the LBA Data and Publication Policy. The investigators were Laura L. Hess, John M. Melack, Adriana G. Affonso, Claudio Barbosa, Mary Gastil-Buhl, and Evlyn M. L. M. Novo. You may contact Hess, Laura (lola@eri.ucsb.edu). The research was made possible by NASA Grants NNX10AB66G, NNG06GF71G, NCC5-691, and NCC5-281. This data product is a land cover map of wetland extent, vegetation, and dual-season flood state for the lowland Amazon basin. The wetlands map is provided in GeoTIFF format using two coordinate systems: unprojected (Geographic) with pixel size of 3 arcseconds, and Albers Conical Equal Area with pixel size of 100 m.
Table 1. Vegetation and inundation cover classes included in the .tif image. Note: The dual-season class coding provides land cover class at both low-water stage (Oct-Nov 1995) and high-water stage (May-July 1996), within a single code. Note that some classes do not change between low- and high-water, and some wetland areas were not flooded during May-July 1996. The SAR-based mapping provided a basis for improved estimates of the contribution of wetlands to biogeochemical and hydrological processes in the Amazon basin, a key question in the Large-Scale Biosphere-Atmosphere Experiment in Amazonia. Accuracy assessment included three interrelated elements: geolocation accuracy, thematic accuracy, and representativeness of average flooding patterns. Overall accuracy was good for both the wetland mapping (93% accurate) and vegetation mapping (86% accurate). Producer’s accuracies were good for all categories except herbaceous (equivalent to aquatic macrophyte at high-water stage) and open water. For much of the basin south of about 6 degrees S, the driest months occur from July to August and the wettest months from December to March. 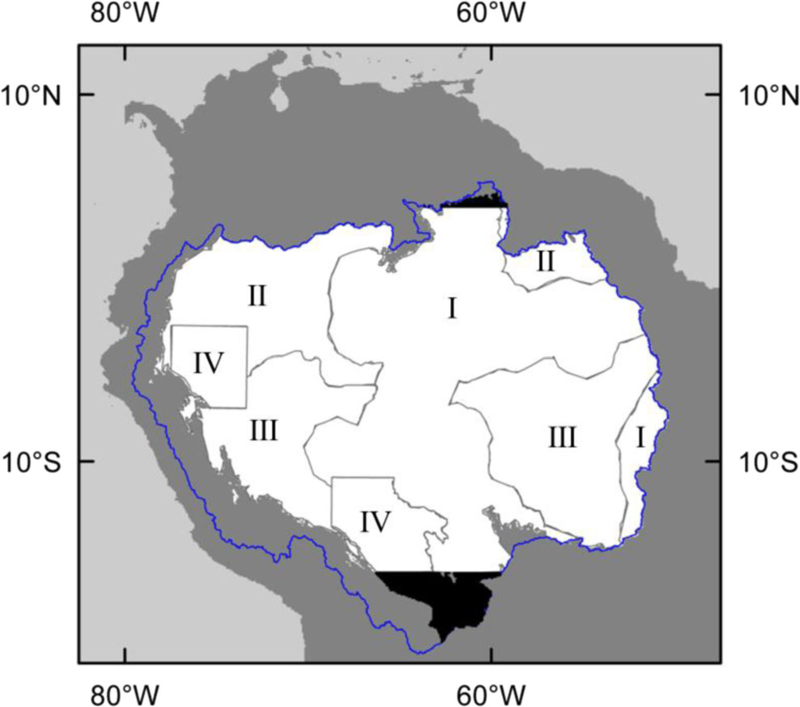 For these areas, dry-season inundation may be overestimated, and wet-season inundation underestimated, based on the JERS-1 mosaics. For the northern part of the basin, timing of minimum precipitation was similar to that of the low-water mosaic except for areas north of the equator and west of -60 degrees, while timing of maximum precipitation	was within 1 month of the JERS-1 high-water acquisitions. Sub-regions within the GRFM study area were designated as one of four thematic accuracy zones (Fig. 2). Zone I was a 500-km buffer zone centered on the 1999 videography flight lines (Hess et al., 2002; Hess et al., 2015). Within this zone, videography-based accuracy statistics should be valid. Beyond this buffer zone, the applicability of the videography-based results depended on whether the vegetation types and flooding conditions in those regions were represented within the videography data set. The remainder of the study area was subdivided into regions where both vegetation and flood conditions were likely to be represented (zone II), and those where either vegetation or flood timing was not well represented in the video data set (zone III). For extensive wetlands in the Marañon-Ucayali region of Peru and for the Llanos de Moxos in Bolivia (Zone IV), accuracy was assessed by comparison with recent high-resolution vegetation maps (Josse et al. 2007 ; Hess et al., 2015). Figure 2. Accuracy Zones. Study area within which wetland areas were mapped using GRFM mosaics (white); Amazon basin boundary (blue); and validation regions. Black areas were mapped using PALSAR and Landsat mosaics. Gray areas within basin are greater than 500 m asl (Hess et al., 2015). The area mapped was the lowland Amazon, defined as the portion of the Amazon watershed below 500 m asl. Using Shuttle Radar Topography Mission (SRTM) digital terrain elevation data (Farr et al. 2007; Jarvis et al. 2008), areas greater than or equal to 500 m asl were excluded. The RiverTools software package (Peckham 2008) was used to delineate watersheds of the Amazon and its major tributaries, setting the Amazon basin outlet where the mainstem Amazon River channel splits into north and south channels west of Gurupá Island (51.4375 degrees W, 0.4583 degrees S). This Amazon watershed delineation excludes the Tocantins watershed as well as most of Marajó Island and adjacent islands of the Amazon estuary, regions grouped together with the Amazon basin in some studies. The resulting study area of 5.06 × 106 km2 is 87% of the total basin (5.83 × 106 km2). The GRFM mosaics did not include portions of Bolivia south of 16 degrees S and Brazil north of 4 degrees N; these regions were mapped using a combination of radar and optical imagery. For this study, wetland areas were defined as (1) areas that were inundated on either or both radar mosaics and (2) areas not flooded on either date, but adjacent to flooded areas and displaying landforms consistent with wetland geomorphology. River channels and permanent lakes and reservoirs are included here within the definition of wetland areas. The second condition is necessary since the two mosaic acquisition periods did not capture high-water conditions for all parts of the basin. Classification of areas under condition 1 was automated, while condition 2 required hand editing by trained interpreters. Under condition 2, a conservative approach was taken; ambiguous cases were thus not included as wetland areas. The wetland definition used is not date-specific, since in addition to automated detection of water and flooded vegetation on specific dates it employed human interpretation of features that were judged likely to be flooded on other dates (condition 2) (Hess et al., 2015). JERS-1 scenes acquired during Oct.-Nov. 1995 and during May-July 1996 were used for the wetland mapping. Scenes were radiometrically calibrated and mosaicked at 3-arcsecond pixel size (approximately 90 m) to create the dual-season GRFM Amazon mosaics (Siqueira et al. 2000; Chapman et al. 2015). The two mosaics are refered to as Blow-water (1995) and Bhigh-water (1996) based on their correspondence to low-flood and high-river stages in the central basin. GRFM mosaic geolocation was based on tie-points located in regions for which 1:100,000 or larger-scale maps were available, resulting in a lack of tie-points and impaired geolocation for some portions of the basin. For our analysis, geolocation was refined using 180 additional tie-points located on the 1990s-era GeoCover™ Orthorectified Landsat Thematic Mapper Mosaics (Earth Satellite Corporation 2002). Tiepoints were restricted to flat areas, and no attempt was made to correct terrain distortions resulting from SAR geometry. For land cover and inundation mapping, five land cover types (nonvegetated, herbaceous, shrub, woodland, forest) and two flooding states (nonflooded, flooded) were defined according to the conventions of the UN-FAO Land Cover Classification System (LCCS) (Di Gregorio 2005). The nonvegetated class is equivalent to bare ground (e.g., sand bar or mud bank) when nonflooded, and to open water when flooded. The flooded herbaceous class includes both emergent flooded plants and floating beds of aquatic vegetation, but omits submerged aquatic plants, which cannot be detected with SAR. The date-specific approach allows consideration of temporal transitions that are common in Amazonian wetlands, such as from nonflooded shrub to open water (as the shrubs are submerged), or from flooded herbaceous to open water (as floating aquatic macrophytes senesce and decompose, or are dislocated by wind or current) (Hess et al., 2015). A wetlands mask was created by segmentation of the SAR mosaics and clustering of the resulting polygons based on mean backscattering coefficient (σ°) (Hess et al. 2003; 2012). Region growing segmentation and iterative clustering into wetland and non-wetland classes were performed using the SPRING software package (Câmara et al. 1996). The minimum mapping unit was approximately 1 km2; however, continuous linear features could include segments as narrow as 1 pixel (approx. 100 m). Within the wetlands mask, a rule set (Hess et al. 2003; 2012) was applied on a per-pixel basis to classify wetland areas into the five land cover classes and two flooding classes based on dualseason σ° values. In order to provide a complete mapping for the lowland Amazon basin, wetlands north and south of latitudinal range covered by the GRFM mosaics (4 degrees N to 16 degrees S) were mapped using a combination of 1) dual polarization ALOS PALSAR mosaics from 2007 to 2010 (Shimada et al. 2014; downloaded from http://www.eorc.jaxa.jp/ALOS/en/palsar_fnf/fnf_index.htm) and 2) mosaics of Landsat images from 2011 (Hansen et al. 2013; downloaded from http://earthenginepartners.appspot.com/science-2013-global-forest/download_v1.1.html). Although these data sets do not include the date-specific flooding information provided by the GRFM mosaics, the combination of optical and radar data, and the cross-polarized (HV) band available for PALSAR, compensate somewhat for the lack of seasonal information. The Landsat and PALSAR mosaics (resampled to the GRFM 3- arcsecond pixel size) were classified using a method analogous to that applied to the GRFM mosaics, except that dual-season classes for these wetlands were inferred based on the strength of the flooding signal (Hess et al., 2015). Di Gregorio, A. (2005). Land cover classification system: classification concepts and user manual. Food and Agriculture Organization of the United Nations, Rome. Earth Satellite Corporation. (2002). GeoCover product™ description sheet, http://glcf.umd.edu/library/guide/GeoCover_circa_1990_Product_ Description.pdf. Hansen, M.C., Potapov, P.V., Moore, R., Hancher, S., Turubanova, S., Tyukavina, A., Thau, D., Stehman, S., Goetz, S., and Loveland, T. (2013). High-resolution global maps of 21st-century forest cover change. Science 342:850–853. Jarvis A., Reuter H.J., Nelson A., Guevara E. (2008). Hole-filled SRTM for the globe Version 4, available from the CGIAR-CSI SRTM 90 m Database, http://srtm.csi.cgiar.org. Josse C., Navarro G., Encarnación F., Tovar A., Comer P., Ferreira W., Rodríguez F., Saito J., Sanjurjo J. Dyson J., Celis E.R., Zárate R., Chang J., Ahuite M., Vargas C., Paredes F., Castro W., Maco J., and Reátegui F. (2007). 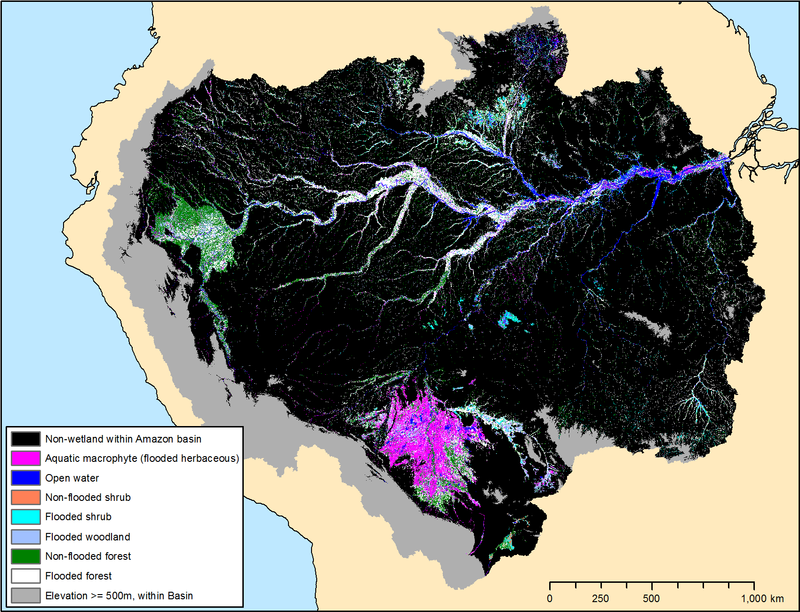 Ecological systems of the Amazon basin of Peru and Bolivia: classification and mapping. NatureServe, Arlington. Keller M., Bustamante M., Gash J., Dias P.S. (2013). Amazonia and global change, vol 186. Wiley. Rosenqvist, A., Shimada, M., Chapman, B.,& Freeman, A. 2000. The Global Rain Forest Mapping project -- a review. International Journal of Remote Sensing, 21, 1375-1387. Siqueira P., Hensley S., Shaffer S., Hess L., McGarragh G., Chapman B.,	and Freeman A. (2000). A continental-scale mosaic of the Amazon Basin using JERS-1 SAR. IEEE Transactions on Geoscience and Remote Sensing 38(6):2638–2644.